Corey the cat took the internet by Stormtrooper over the past week after the Monmouth County SPCA posted a picture of him to their Facebook page. Corey was looking for a forever home, but his photo went viral after some people noticed a strong resemblance between the cat and actor Adam Driver, who played Kylo Ren in the movie Star Wars: The Force Awakens. It didn’t take long for the internet to show Corey some love, and sure enough a woman from New Jersey made the trip and adopted the kitty. Corey’s name has been changed, appropriately, to Kylo Ren. Kylo, as he’s now called, is a vocal kitty who likes to chat. He also loves pets and even belly rubs, and his owner says he craves attention and hates to be left alone. He’s found his forever home. 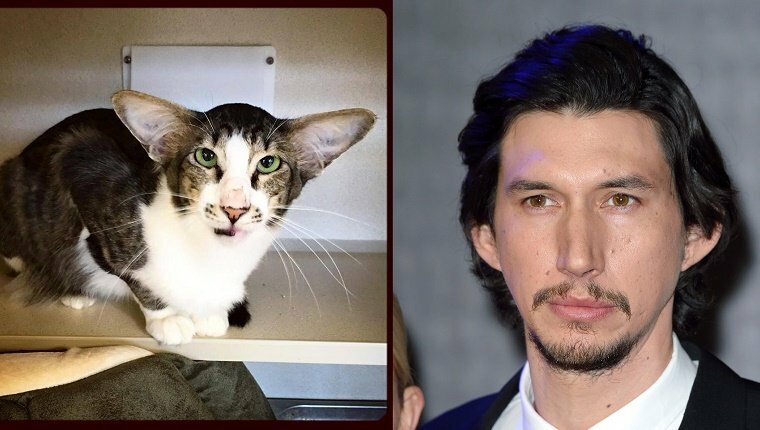 If you’re wondering what kind of breed makes an Adam Driver cat doppelganger, the Monmouth County SPCA claims that Kylo is an Oriental Shorthair, though it seems he could possibly have a mix of Javanese or Balinese, as well. Whatever went in to making this kitty, he sure does have a unique look. Do you see the resemblance? Are you glad Kylo found a forever home? Let us know in the comments below.